MOSCOW — The Russian Orthodox Church is known for its conservatism, pro-Kremlin leanings and Byzantine aesthetics. Now add cats to the list. 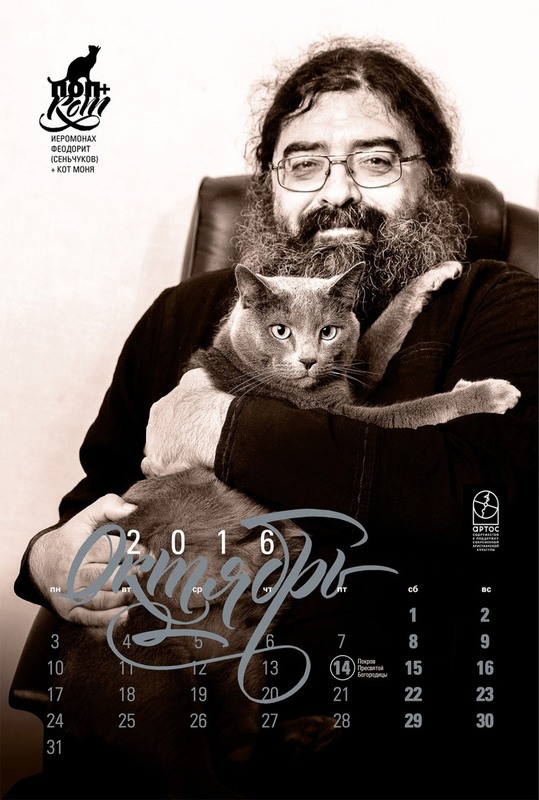 A dozen Orthodox clerics posed with their cats for a new 2016 wall calendar dubbed simply "Priest and Cats" — "Pop & Kot" in Russian. The wall calendar featuring felines of all stripes and sizes being hugged by bearded, beaming and largely bespectacled men in glossy black-and-white pictures went on sale last week. It combines two Italian publications — the Vatican’s Calendario Romano, featuring young and attractive priests, and Gatti di Roma, a roundup of Rome’s most photogenic cats — according to creator Xenia Loutchenko. Selling for 990 rubles ($14.30) each, the calendar has become an online hit and has been featured in the country's top newspapers and news site. Its success has caught Loutchenko by surprise. Since it was published, the calendar's creators received calls from more priests saying they also have cats and would have loved to pose for a shoot. The Moscow Patriarchate, the governing body of the Russian Orthodox Church, could not be reached for comment on Monday. “But I wouldn’t hang it on my wall,” said Chaplin, who is known for his rants against American policies, short skirts and gay rights.